Hezbollah - the Lebanese Shia political and militant movement - has long held a commanding position as the country's most powerful armed force. It has historically fought Lebanon's southern neighbour Israel and, more recently, against rebels in Syria. The strategic shift helped turn the tide of the war in favour of the Syrian regime, but brought with it a new threat to Hezbollah, which its military capabilities are unable to contain. From roadside bombs to rocket attacks and assassination attempts, Hezbollah is facing a growing campaign of violence which has reached deep into its Lebanese heartland. An explosion earlier this month struck the group's bastion in Dahiyeh, a southern suburb of Beirut, injuring more than 50 people. The fact that attackers breached security in one of the movement's tightly controlled strongholds is a worrying development for it. However, Amin Hoteit, a former army officer close to Hezbollah, believes such breaches "are a sign of strength rather than an indication of weakness". For Mr Hoteit, this kind of attack reveals the inability of the people behind them to confront Hezbollah directly on the battlefield, and they therefore resort to such tactics. When Hezbollah's fighters first entered Syria a few months ago, many border towns deemed to be under the control of the Shia movement were shelled. Last May, two rockets were launched into the area bordering Dahiyeh. Back then, Hezbollah officials said they had got the message but remained defiant. In a sign of further escalation, convoys of Hezbollah fighters and politicians, on their way to Syria, have occasionally been struck by roadside bombs. "These attacks will not inflict a lot of harm on Hezbollah but they will keep it on its toes," says Mr Hoteit. "These tactics aim to disperse Hezbollah's capacities and to force it to stay on high alert, therefore, to exhaust its forces and distract it from achieving other plans." Hezbollah is not short of enemies. It is embroiled in a sectarian and political conflict inside Lebanon. It is also, alongside its strongest ally Iran, an avowed enemy of Israel. But it is the military intervention of the party on the side of regime forces in Syria that has aroused the most intense hostility against it in the region. "Hezbollah brought it upon itself," according to Wehbe Qaticha, a military expert close to Lebanon's 14 March coalition which is opposed to Hezbollah. 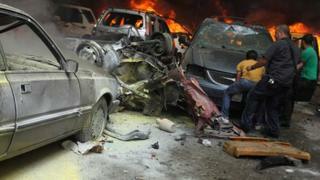 According to Mr Qaticha, the attacks are a natural reaction to Hezbollah's military campaign in Syria. Hezbollah has received several warnings from different armed opposition groups in Syria threatening to target it and move the battle into Lebanon if it does not withdraw its fighters from there. Mr Qaticha suggested that it is very unlikely that these attacks, seen as a punishment for Hezbollah, will result in any change on the ground in Syria. "Hezbollah's intervention in Syria is an Iranian decision, and it's actually incapable of withdrawing from Syria at the moment even if it's targeted at home," he said. Recently, the American publishing company McClatchy reported that the CIA warned Lebanese officials that al-Qaeda-linked groups are planning a campaign of bombings targeting Hezbollah's areas and figures. Hezbollah declined to comment on the issue. The CIA does not communicate directly with Hezbollah, which is classified as a terrorist organisation by the United States. In one justification of its military intervention in Syria, Hezbollah claimed it was conducting a pre-emptive military campaign to stop Jihadis moving their activities into Lebanon. Hezbollah says it is fighting in a neighbouring country to prevent the conflict spilling over the border. Ironically, it might have ended up drawing it closer.